This coffee maker is hand made in Holland. 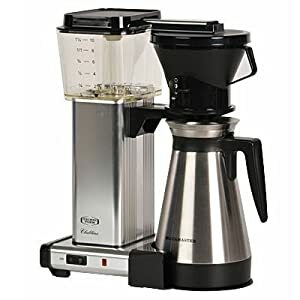 It maintains a perfect brewing temperature throughout the process of making a perfect cup of coffee. It uses an independent energy-efficient heat exchanger that brews directly into the stainless-steel-lined ThermoJug server. In this video Poul Mark, founder of Transcend Coffee in Edmonton, Alberta Canada demonstrates how to brew a great pot of coffee with the Technivorm Moccamaster drip coffee brewer.